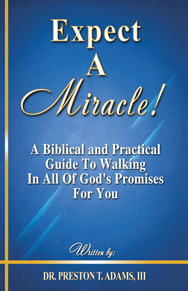 A Biblical and Practical Guide to Walking in All of God’s Promises for You shows that miracles happen around us every day, and that we need to seek God for them to happen to us. The answer to our problems in our hands. We need to ask God for what we want. We need to keep on knocking until we get what the Lord has promised us. God commands us to ask Him for what we want. Expect A Miracle will have you thinking about miracles in a new way. What’s more, you’ll be expecting them in your life!